a lattè macchiato. This is a glass of hot milk with coffee added after­wards. Usually. There are two schools of though: one view is that the difference between a latte macchiato and a caffè latte is that with a caffè latte the milk is added to the coffee rather than the other way round. The other view is that the difference between the two lies in the amount of coffee - with a latte macchiato having just a touch of of milk to stain the milk (as the name suggests), while a caffè latte has more coffee. Some baristas will ask you how much froth (schiuma) you want. a caffè americano is an espresso with water added. As well as normal coffee, most cafes have decaff coffee (decaf­feinato), orzo (made with barley), tea, and you might even be able to get a tisane. Italians will tell you that you simply don’t drink capuccini/​latti macchiati after midday (or even late morning). In fact some people do, but having a cappuccino after dinner is something only a foreigner would do. 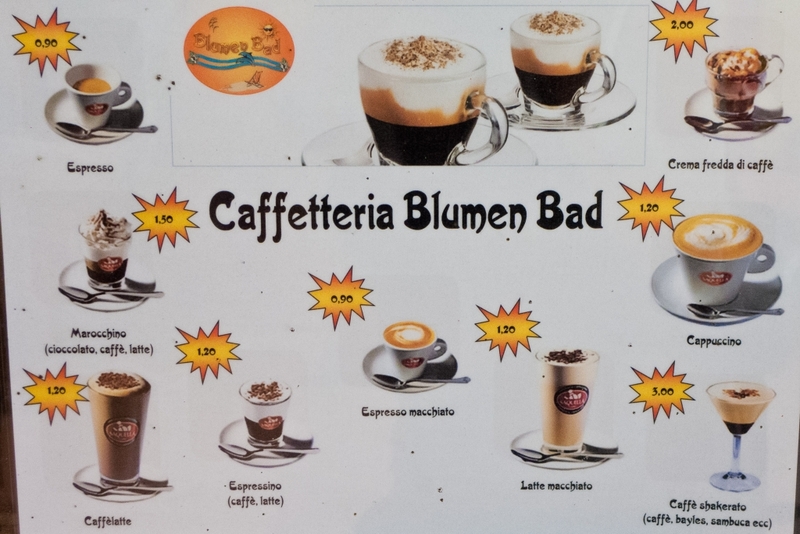 Some places will ask you if you want chocolate (cacao) on your capuccino- many places just serve cappuccino without. In most cafes and bars you are served and then you pay at the cash desk (cassa) when you leave, but in rail stations and busy bars in city centres for example you may well need to pay first and then give your receipt (scontrino) to the serving person (some gelaterie do the same thing). You may see a notice with something like “rivol­gersi alla cassa” or “munirsi con il scontrino” - but then again you may not. There are also rules that are difficult to fathom about whether you go to the bar and get your drinks and then take them to your table, or whether you wait for someone to come to take your order, or whether you go to the bar and order what you want and then go to your table and wait for the someone to bring them out to you (the last is more common in my exper­ience). In most places, you pay the same amount for a coffee at the bar as you would for a table. But not always. If you are drinking at a place with a central, expensive location, like the main square of a city, then you might well pay more to have your coffee at a table, especially in tourist areas. Again, it's not easy to tell what the rules are. And when it comes to coffee and cafes there are crois­sants. Except that in the south and in central Italy (basically anywhere south of the Apennines) they are called cornetti and the north they are called brioche or a croissant. The generic name is "pasta" (pastry) which can also be a little confusing. Croissants in Italy often, especially in the north, come filled with jam (marmellata) or crema (a sort of custard) or Nutella. This is fine if that's what you want but can be an unwelcome surprise if you weren't expecting it. Sometimes there is a tell-tale hole where the sickly sweet stuff has been injected, but other times it"s not apparent. If you want a plain croissant you need to ask for a brioche vuota or a cornetto semplice. In Liguria, and the parts of Piemonte that were part of the old Repubblica di Genova, most people have a piece of plain focaccia instead of a croissant. In much of the south and centre south (and Bologna) it’s common practice to serve coffee with a small glass of water. In other places you may need to ask, and you may be charged a small amount.